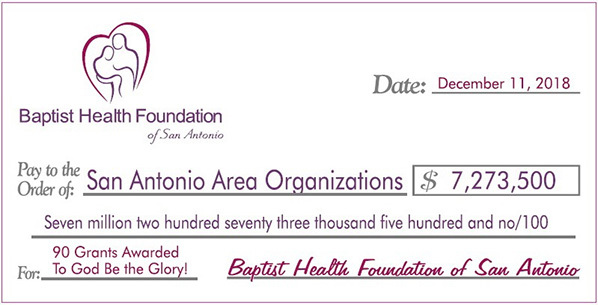 Baptist Health Foundation of San Antonio distributes grants annually to not-for-profit organizations which provide healthcare services and health education throughout Bexar County and contiguous counties in South Texas. Since 2005, the Foundation in conjunction with Baptist Health Services Foundation has awarded 1,064 grants totaling $75,158,493 to organizations in our eight-county region. In 2018, we awarded 90 grants totaling $7,273,500. By the grace God has given me, I laid a foundation as a wise builder, and someone else is building on it… For no one can lay any foundation other than the one already laid, which is Jesus Christ.